There once was a time where traditional telecom providers were the only available option for phone service, telling YOU what service you can have and at what price. That was until providers, such as Sangoma, offered a significantly better alternative through SIP Trunking, allowing you to connect to a provider using your standard Internet connection and receive flexible and rich services at up to 60% less vs the cost of traditional services. For years now, Sangoma Technologies has been providing high quality Voice Over IP (VoIP) phone service, with no-contract, for North America using its own SIP trunking service, called SIPStation. 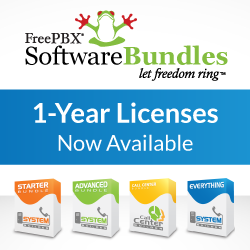 Designed for the highly popular FreePBX and PBXact phones systems, SIPStation offers an unrivaled approach for activation and provisioning, getting your service up and running within minutes. The ingenuity is all built into the SIPStation Store, which allows you to purchase and automatically configure your service all in one go. In fact, this is built into Admin GUI of the PBX, where you can even sign up for a 21-day “no-strings attached” trial. Today, we are excited to announce the next generation of the SIPStation service, which offers more flexible service options, meaning more cost savings for our customers! This is all made possible with the introduction of Trunk Groups. This allows customers to share their voice services across multiple office locations. Prior to this update, customers requiring service for their branch sites needed dedicated voice lines (or SIP trunks) for each site, which means dedicated monthly costs for sites that many not even have high call volume. Now, with the new Trunk Group feature, customers can choose to share their voice lines across all their sites, offering significant cost savings. The new feature also allows customers to share their phone numbers (or DIDs) across different phone lines too! Leveraging the power of Trunk Groups, the new SIPStation also offers enhanced failover options, keeping your service UP and running when things go wrong. With Trunk Groups, if one of your locations PBX goes down you can have your inbound calls, on a per phone number (DID) basis, automatically failover to different PBX(s) in your trunk group and still receive your inbound calls. Stay tuned for more great upcoming features!